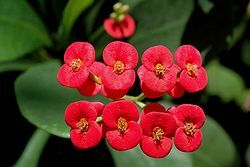 Euphorbia milii (also called Crown-of-thorns or Christ Plant) is a woody, succulent species of Euphorbia native to Madagascar. The species name commemorates Baron Milius, once governor of Réunion, who introduced the species to France in 1821. It is suspected that the species was introduced to the Middle East in ancient times, and legend associates it with the crown of thorns worn by Jesus. Wikimedia Commons has media related to Euphorbia milii. This page was last changed on 12 March 2013, at 13:02.